Work continues on the ship, book and several other projects. I started adding the detail parts to the ship and did some weathering. Weathering such a large object was a lot of fun. I focused on weathering the hull, especially the anti-foul paint that was visible. I used my airbrush and paint brushes to add rust and faded paint. I tried spraying lines on the hull using soft masks to hint at the underlying frames beneath the hulls panels. I did the same to the hatch covers, spraying a crisscross pattern to simulate the ribs. Speaking of the hatch covers, I added laser cut corner castings using self adhesive Bristol Board, painted them yellow, and stuck them on the hatch covers. That was more of a pain in the neck than I expected, but they add a nice detail. Next I worked on the antennas for the superstructure. I made the main mast out of various pieces of brass tube using a photo of an actual ship as a guide. I like working with brass and this was the perfect opportunity. The kit comes with two trays of cast fittings and various supplies. Some of the casting as quite good, while some I discarded. The radar mast base was one that I discarded, but the radar's spinning head was good. The search lights are quite good, as in the DF antenna -are these still in use and appropriate for a modern ship? Next I painted the stack and added a Alkem Flying A logo. In the meantime, I have been writing and working on the book. It is coming along very well. As usual, I have way too much material to use and the challenge is trying to determine what to cut. I also worked on some projects for other folks. Last weekend I stopped by Paul Dolkos's house to see how the pier shed I have cut for him was coming along. I also worked on a project for my brother that involved laser cutting some buildings with exaggerated perspective. They are for a bonsai tree exhibition that he is building as a shadow box. It will be interesting to see how that comes out and how the bonsai artist react to a very non-traditional display. Yeah, I finally got to paint the hull in the final colors. First I gave the whole model an overall coat of Rustoleum flat red primer. I let that dry overnight. Next I masked off the water line and deck area, leaving the area that would be blue uncovered. Then I painted that area with red primer one more time. Why? This helps seal any gaps in the masking tape. Any paint the seeps under the tape will not be visible. I learned this trick many years ago while watching Mike Lech's modeling show on PBS. After a half hour of drying, I painted the blue parts of the hull with Tamiya Flat Blue thinned 50-50 with alcohol. This is probably the easiest paint to airbrush, as it flows readily and dries quickly. I used my Grex airbrush with a 0.7mm tip and 20 psi. After spraying about three quarters of the bottle of blue in multiple coats (yes, it is a big model), I set it down to let the paint set. During this time I cleaned the airbrush. With the paint dry, I inspected the finish and it looked good. So I removed the masking tape. I had some blue overspray in the freeing ports, but I expected that. The next step was to mix up a batch of Vallejo Cavalry Brown thinned with Vallejo thinner. I carefully sprayed from the top down to touch up the overspray and to give the hull deck and hatches the same deck color as the superstructure. The cavalry brown is a bit more red than the flat red primer. I did not mask the blue. I just made sure I was spraying from angles the would not hit the blue. It helps to use a 0.7mm nozzle with only 20 psi. That helps minimize overspray. Since this model is too big for my spray booth, I painted it on top of the booth and wore my respirator. With most of the grunt work on this model done, now the fun begins as I add details and weather it. I made the hatch covers and holds for the ship model. This model will show the hatches in a closed position as I plan to show it loaded with wind mill parts. I built the holds as a separate assembly since it is essentially a shallow box. I cut the parts with the laser using 1/8th and 1/16th inch acrylic. I used photos of the prototype MV Jummetor as a guide for the hatch design including the oval shaped reinforcement plates. I think they add a nice bit of visual clutter to the simple hatch design. This shot shows a 3 bay covered hopper next to the ship for a size comparison. Also, there is a 20 ft container on the rear of the hold. While many of our model railroad friends are partaking in ProRail 2016 in San Diego, Paul Dolkos and I decided to have a mini-ProRail East. 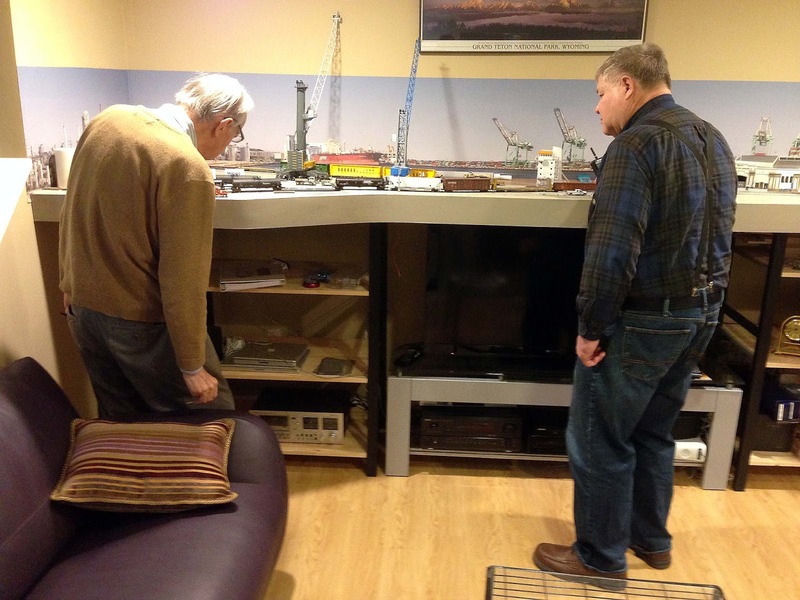 So this afternoon, John King and Paul Dolkos came by the house to operate the PoLA Layout. John took the throttle while Paul was the conductor. I gave them a brief run down and set them loose. Things appeared to go smoothly. It took Paul a few moments to get accustomed to my switch list. Then they got busy. They reported no major problems, though John suspects that the coupler on the PHL 66 SD-40 is a bit low. John enjoyed the session and said in his normal deliberate manner, "Well, I made it to LA without having to take an airline flight." While they switched the layout, I continued to work on the ship. Previously, on Friday night in the waning light of the evening I cut off the ship at the water line. Then I added the hawser reinforcements. I tried adding the bulwark frames, but found that gluing the small pieces of styrene to the fiberglass hull was difficult to do. So I lined the inside of the bulwarks with a layer of 0.020 inch styrene. I had to trim and fit the liner pieces to the complex curves. A little bit of putty was needed to hide the seams. Tomorrow I'll add the frames using styrene glue. That should go much more smoothly. It's starting to look good after a coat of primer.